First off, I want to thank all of the THFF fans and readers out there. Another year of THFF is right around the corner and I'm excited about the opportunities that may lie ahead. Without you guys, THFF wouldn't be in existence. The support means the world to me. I'm humbled when a fan approaches me at a show, shakes my hand, and thanks me. I should be the one thanking you guys. Again, I can't thank you all enough for the support and camaraderie over the past several years. I want to wish you and yours the merriest of Christmases. Enjoy time with family and friends. I implore you to take a moment to reflect on our many blessings and ultimately why we celebrate CHRISTmas. Click the picture to read the article. We all know who Tim Tebow is. Lately he's been the star of every single pregame show on every single network before every single NFL football game. I won't go any further on how I feel about Tebow, but I will share a pretty funny picture and article (above) from Field and Stream. Yep, Tebowing has finally reached the fly fishing community. It's going to remain rainy and dreary through Christmas Day across the south. A conveyor belt of storm systems will make for a soggy couple of days. 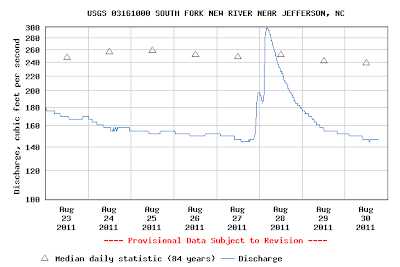 Get ready for rising rivers if you plan on heading out for a day of fishing. The majority of the streams and rivers in WNC are at normal levels, but that will likely change as rain filters into the region over the next few days. Watch out for BWOs, as the dreariness sometimes brings them out. I'd use your typical nymphs until the rivers start to rise. Pheasant Tails, Princes, Hare's Ears, Lightning Bugs, Micro Mays, and Zug Bugs (amongst other choices) should work. Try your favorite streamer when the water rises. Zonkers, Woolly Buggers, Clousers, and Matukas being examples. Cast to the opposite bank and slowly strip your streamer of choice back. Get a rythym going. You know, strip, strip, strip, stop, strip, strip, etc. Dead drifting your streamer can be deadly as well. Good luck, and send in those fish pics for the THFF Fish Wall! Here at THFF, you guys have probably noticed I love this great country. Love would actually be an understatement. While driving home from work, I heard Dierks Bentley's new song, "Home." I thought the song was moving and inspirational. Until I saw the music video. "Moving" and "inspirational" doesn't begin to describe how powerful it is. The soldiers that are coming home from Iraq have been fighting for everything in this video. THFF is a fly fishing blog, but without the freedom we possess, I highly doubt THFF would be in existence. 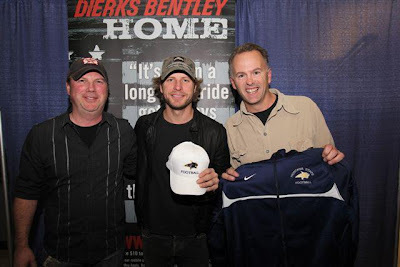 Oh yeah, Dierks is an avid fly fisherman. Notice the Simms trucker hat..
Me: I feel ya man. Haven't been out since early November. Refresh my memory... what does a trout look like again? Griz: It has two legs, right? Me: Pretty sure they're related to giraffes, but I'm not 100% sure. Griz: Yes, they both have spots and run real fast. Griz: that's when they put their young in their tail and hang from rocks, right? Me: I'm posting this convo on the blog..
December is here and you're probably looking to find that perfect gift for that angler/fly tyer on your list. What better way to check that angler off of the list than a visit to your local fly shop? Not only are you greeted and helped by fellow addicted fly anglers who live and breath fly fishing, you are helping to stimulate your local economy. It's a win-win situation in my book. Big box stores are choking small businesses. I'm not bashing those large corporations, but simply saying that local fly shops will greatly appreciate your business. I'll admit, every now and then I'll purchase a thing or two from one of the big box stores, but I do it sparingly and usually only because my local shop doesn't carry the item I'm looking for. Whether or not you order online or at the shop, spread the love! Show your support. Not sure what to get that angler? Here's a top ten list of some popular fly fishing items that are sure to make any fly fisherman all giddy inside. Keep in mind, some shops don't carry certain brands (Orvis dealers may not carry Simms products and vice versa). Have a recommendation? Feel free to share! Fly anglers are known for sporting a myriad of decals on the back of their trucks. Those decals are pretty much the equivalent of tattoos. A lot of times, you can easily discover the angler's preferred rod brand, wader brand, favorite shops, favorite fishing sites/blogs, whether or not they enjoy freshwater of saltwater, etc. Jeff Harrell over at Finatic Designs is now selling WILD! trout decals, so now everyone will know you are wild trout addict. They look nothing short of sick. 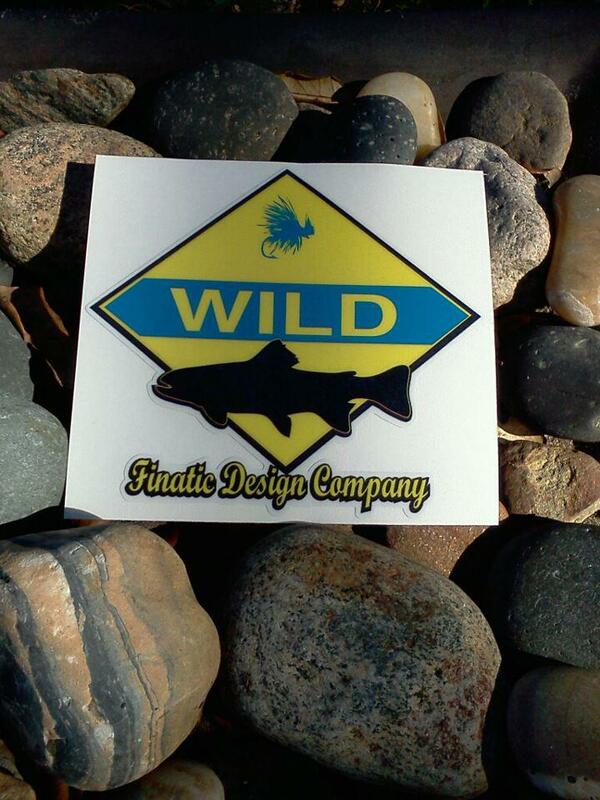 It's a great looking design that immediately lets other anglers know that you support wild trout. Click the pic to order one (or two, or three, or four)! I'm up in SW Virginia currently looking out across the the old, rugged, Appalachians. I'm definitely thankful for the fact that I'm not swimming in the crowds right now. It's a zoo out there folks! Many are out risking their lives shopping on this Black Friday (alright, it's not that bad, but as y'all know, it's just a little hectic). If it's anything like last year, tonight's news should be entertaining to say the least. If you're out on the river, enjoy. Picture perfect weather out there is giving way to some picture perfect fall fishing. Enjoy every minute of the beautiful weather, because Old Man Winter is on his way and judging by the forecast, he's going to barge through the door like Kramer from Seinfeld. We're about to see a transition from warm to cold beginning about early next week and likely lasting for several weeks. I'll have more in depth information over on Carolina Weather soon. Will this transition have an impact on the fishing? You better believe it. For the time being though, your generic patterns will catch fish on most rivers. On DH waters, try a Squirmy Wormie, Eggi Juan Kenobi, Prince Nymph, Copper John, Pheasant Tail Nymph, San Juan Worm, Para Adams, Stimulator, etc. Try ripping a Zonker or Woolly Bugger across a pool. If you;re fishing more technical water, such as the Davidson, midges and smaller nymphs/dries coupled with thin, long leaders need to be used. Send in those NC fish pics for the THFF Fish Wall! You can email them to me at wncflyfishing@gmail.com, or send them via Google + or Facebook. The brave men and women that have fought, are fighting, and have bravely and selflessly laid down their life for this great nation are true heroes. Albeit most I've had the pleasure of talking to humbly disagree with the fact they are heroes, they have defended our great nation so that we can live in a free country. 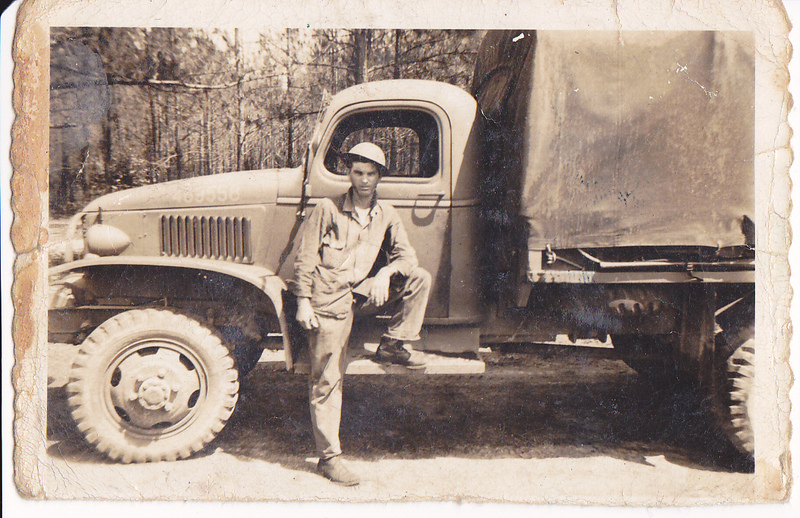 My great grandfather, one of many heroes. Sifting through a shoebox full of my great grandfather's pictures, I came across several photos, circa early to mid 1940s from his days in Europe during the largest and most violent war mankind has ever witnessed. He never spoke of the war. Not one mention. We were utterly clueless about his involvement in WWII until he passed away. Upon realizing what he had accomplished, we all were speechless. 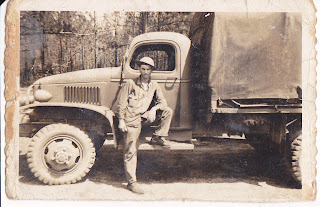 My great grandfather, PFC Johnnie Gunter, was an MP with the 103rd Infantry Division out of Rapides Parish, Louisiana. We later discovered he drove amphibious boats onto the banks of Normandy during D-Day. As they landed, I'm sure he witnessed some of the most horrific scenes he's ever had the displeasure of seeing. I can't begin to imagine. I quickly realized why he kept this info to himself. To this very day, sifting through that shoebox full of photos and antiquated documents is a bit overwhelming. Veteran's Day is winding to a close. Frankly, I believe everyday is Veteran's Day. I salute all that have served—from the Revolutionary War to the current War On Terror—all that are currently serving, and all that are gearing up to serve the red, white, and blue. Without you guys, the United States of America wouldn't be what it is today. Whether you're in the USMC, USAF, Army, Navy, or Coast Guard, I say thank you for everything you guys do. Expo Recap, With Some Fishing On the Side..
Wrapping up one great weekend! The 3rd annual WNC Fly Fishing Expo was a success, with a host of anglers, dealers, shops, demonstrators, and anglers in attendance. Great to see everyone there! Already looking forward to next year. This morning I met my buddy Kevin on the Davidson, where we both were determined on putting a fish over 20" in the net. Kevin and I have been fishing the backcountry brookie streams all summer long, so it was definitely a change of pace hearing the reel zing and watching the rod bend. It's been a while since I've landed a fish over 10", given my incurable brook trout addiction. Of course the first fish of the day happened to be a stocker brookie. I guess I'm cursed. We both netted a handful of wild rainbows/browns in addition to plenty of those pesky northern strain brookies that have escaped from the adjacent hatchery. In the end, no fish over 20". I lost count of how many times we both either missed a strike or broke off on a huge fish. In fact, the most common phrase used today was "I had him" and "man that was a nice fish". All in all though, we agreed it was a good day. With that being said, we were not the only anglers that didn't meet the goal of the day. The kid, fly rod in hand, stomping back to the car with his arms crossed, was introduced to the technicality of the Big D. We all love the Davidson, but man alive it can make you lose your mind if you don't bring your A game. The challenge brings me back though. The Squirmy Wormy strikes again. A wild brown from the upper D.
Kevin with a nice bow. 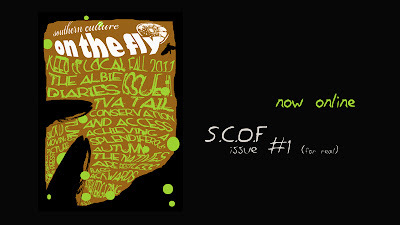 The fall issue of Southern Culture On the Fly is here! Click the pic to read the zine. NC trout tour trailer from Jeff Harrell on Vimeo. Check out Jeff's site, Finatic Design Co where you'll find shirts, stickers, hats, etc. Jeff is an artist specializing in some jaw-dropping fish prints. Check out his Facebook page for more. I'm digging this decal. Available at Rivers Edge Outfitters, Spruce Pine. NC DH streams are stocked and ready to go! The state doesn't stock all waters on opening day (last Saturday), but they finished stocking over the course of this week. If you're heading out to a DH stream this weekend, the fish are ready to be caught. Don't be surprised if you see (or better yet, catch) a pig. The state has done an outstanding job of stocking larger fish over the past few years. For the most part, these fish are not educated enough to be overly tough to catch. Generic patterns such as Prince Nymphs, Pheasant Tails, Hares Ears, Zug Bugs, Red Fox Squirrel Nymphs (just to name a few) will work wonders. #14 Stimulators, #14-16 Adams, #14 Royal Wulffs, #14 Elk Hair Caddis are great as far as dries go. If you really want to put a beating on the fish, check out Dave Hise's signature Orvis flies. His Squirmy Wormy, Hise's Hetero-Genius, Medusa, and Eggi Juan Kenobi will drive the fish mad. I've found them to be unbelievably effective on stockers (wild fish fight over them too). Check out the rest of Dave's selection here. Below is the stocking report sent out by the NCWRC 4 hours ago. All streams in the list below have been stocked. Enjoy the weekend! It's shaping up to be a good one weather-wise and fishing-wise. Tell us how you do! Albeit we live in the Southeast, we (NC, especially WNC) see snow on a regular basis from December through March. When it falls on September 30th and October 1st, it gets a bit a lot of attention. Yesterday evening, I noticed that Brad Panovich, Chief meteorologist for WCNC, tweeted about snow beginning to fall atop Beech Mountain. Being the weather geek I am, I pulled up the current temps at the summit of Beech along with the dew points and radar. Low and behold, the cold air was thick enough to allow snow flakes to fall down to the higher elevations. So, I sat around and watched the live webcam up on Beech Mountain for a while. The snow came down at a pretty good clip for quite some time. Then, Boone received some snow this morning. Plenty of pics/videos floating around. Check out some of the pics/videos over on Brad's blog. Still some flakes falling out there as I type. Check out the live webcam up on Beech Mountain here. I was tempted to just post this over on the new Carolina Weather Blog, but thought I'd share the news here on THFF. Not a huge deal. I will admit though, it's pretty cool watching snow flakes fall on September 30th. Cooler Weather, Football, Now DH Season! Fall has arrived! Anglers across NC have been counting down the days. Delayed Harvest picks back up on Saturday, October 1st, giving fly anglers another fishing opportunity. Wild and catch & release waters have really been the only promising destinations, as always in the summer. Hatchery Supported waters, as a whole, have proven to be highly variable as hot summertime temperatures and harvesting have resulted in poor fishing. The combination of the delay of harvesting fish and cooler temperatures associated with DH season will open the doors for some spectacular fishing pretty soon. To top it all off, the weather looks to be cool with crisp mornings by next weekend. Remember, not all DH waters will be stocked the very first day (October 1st). However, most will be stocked within the following days. 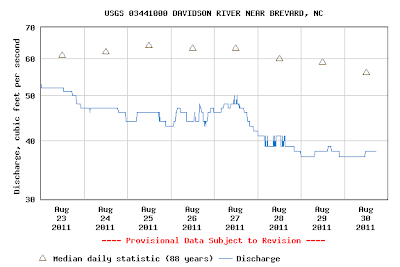 Check the NCWRC Stocking Report throughout the season for a weekly update on what waters have been stocked. They update the report every Friday at noon. 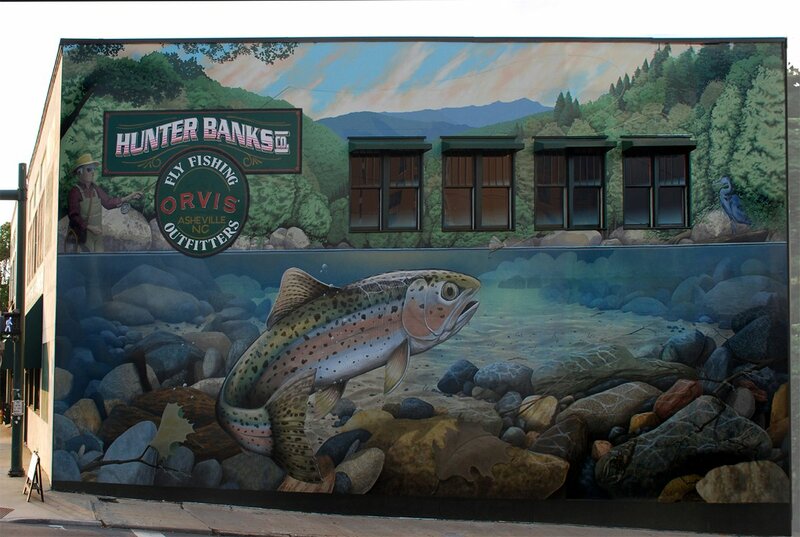 The guys at Davidson River Outfitters do a great job of informing everyone on what waters have been stocked in the Asheville area. 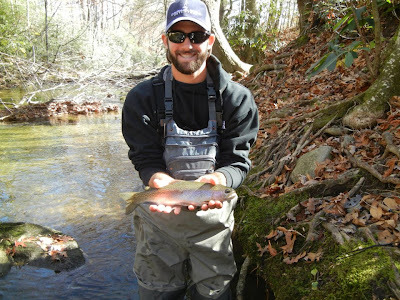 For more information on delayed-harvest regulations, weekly stocking updates, or trout fishing maps, visit www.ncwildlife.org/fishing. So, who's planning a DH trip in the near future? The weather as of late has been highly variable, unseasonal, and really, just plain unusual. Late last week, a cold front swept through, erasing the hot, muggy conditions we've all grown so accustomed to. Behind the front, a meteorological phenomenon called cold air damming, or the dreaded "wedge" took hold. Discover what cold air damming is over on the Carolina Weather Blog. I'm confident we are done with the 90s across WNC. 80s will be considered "warm", 70s will be considered normal, and 50s/60s will be considered "cool"for the time being. Technically, Fall starts Friday, although I think it's safe to say summer ended last weekend. Temperatures are on their way down. We should start seeing the first snow flakes of the season across the highest terrain next month. The cooler temperatures are definitely welcomed by the fish (and us humans). The cooler weather will gradually give way to warmer temps as we progress throughout the week. With that being said, unsettled weather is expected over the next few days as the battle of the cool and warm airmasses ensues. The fishing conditions will likely go up and down as a result. If you are out on the river, keep an eye out for rising water this week. With storms in the forecast, water levels could rise with little to no warning. Terrestrials continue to work well across the Carolinas. Beetles and ants are probably the most widespread, but a hopper or inchworm will almost always produce. The terrestrials will continue to be common until the first frost kills them off. Depending on the location, the first frost can occur anywhere from late September through mid November. Higher elevations usually see the earliest first frosts. I would carry some terrestrials with you for another month (give or take a week) depending on the weather. Keep an eye out for green caddis. They are starting to hatch, which means fall is moving in. A #14-20 Green Elk Hair Caddis should work well. Drop a small #16-22 soft hackle behind the EHC if you'd like. As far as nymphs go, Copper Johns, Pheasant Tails, Princes, Lighting Bugs, Hares Ears, Red Fox Squirrel Nymphs, Caddis larvae, and most other generic nymphs should bring fish to your net. Delayed Harvest waters will be stocked soon. Most will be full of trout over the course of next weekend. I will post the stocking schedules as they are updated. If you're a diehard DH angler, hang in there, DH is on the way! Mark your calendars! 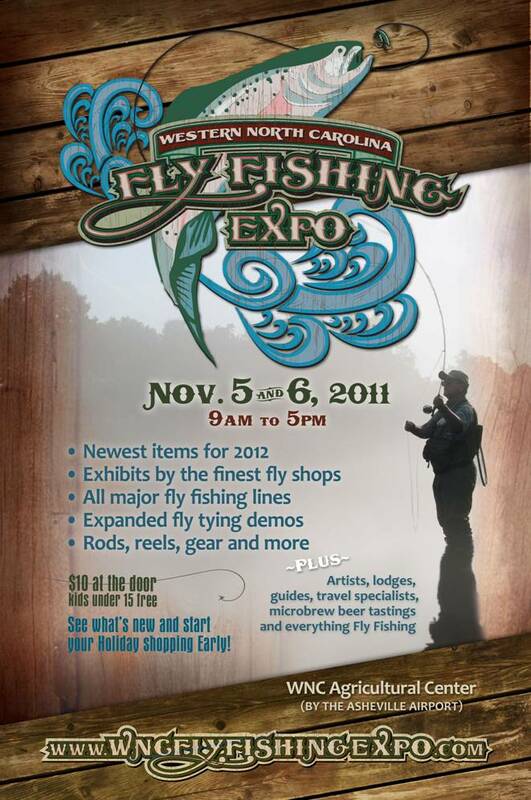 The WNC Fly Fishing Expo is right around the corner. Complete with a slew of programs from expert anglers, plenty of exhibitors, some of the best BBQ in the area, beer tasting, and more fly fishing gear/fly tying supplies than you you can shake a stick (or 5wt) at. I was asked again to do tying demonstrations, so I'll be hanging out during the latter part of Saturday AM (fishing from dawn until about 10:30 of course) and doing tying demos Saturday afternoon until about 5pm. The Expo will be held on November 5th and 6th at the WNC Agricultural Center in Asheville. $10 at the door, kids under 16 get in free. A lot of rain heading towards the Carolinas. Areas across WNC are likely going to see 7-9" of rain, with pockets of 10"+ in some areas. Rivers and streams will be blown out fore a while. If you plan on fishing over the next week or so, use extreme caution when in and around rivers. Attempting to wade would be life threatening. Currents can easily sweep the strongest and heaviest individual off of their feet in a split second. For more, check out the Carolina Weather Blog. Yesterday marked what will probably be my last bluelining excursion until next spring. The window of opportunity to head to the streams is slowly shutting with a busy schedule ahead. Will it open again long enough for me to sneak back to these high elevation streams before they freeze over this winter? Time, as they say, will tell. This particular trip yielded plenty of colorful specks, all of which are preparing for spawning. The males are already beginning to display their colors, kyped jaws, and on some, decent sized teeth for a 7" fish. It's a bit early for fall spawning in most places, but at these high elevations of about 5,000ft+, it's all behind schedule. Fine by me! Colorful brookies galore! Arriving at the stream at 10:00AM, it was in the 60s. Perfect fishing weather in my opinion. The temps heated up a bit as the day progressed, but the fishing did as well. Great day on the water. Glad I got out to fish yesterday, as early next week, most streams are going to be blown out. A lot of rain on the way. Check out the precip map to the left. An Extended Body Inchworm and a Green Weenie was all I needed for the day. While fishing one particularly large pool below a sizable waterfall, the EBI sent 10 fish flying to the surface, all bumping heads in the midst of a mad frenzy. One lucky fish (well, lucky for a split second, until he realized he screwed up) was brought to hand. Although he was 6", this fish looked as if someone splashed a multitude of different colors onto him. Small stream, but plenty of fish. Just have to know where to look for them. A lot of "skinny water" here in WNC. Although it's not unusual to have low water in August/September, a prolonged period can have plenty of negative effects. Last year, a lot of streams dwindled to just a trickle by late September. I hope this won't be the case this upcoming September, but without enough rain, I'm afraid it will. A cold front set to sweep through the Carolinas next Monday may give numerous streams a much needed boost. Storms will likely fire ahead of the front, dropping plenty of rain in areas that see the storms. Keep your fingers crossed. Until we see the water levels rise, your typical summertime techniques should be used. Long leaders, light tippets, and drab clothing are crucial. Your presentation is much more important than your fly selection. Wild trout here in NC are rarely ever picky. If they don't take a swing at your fly, chances are the presentation wasn't up to par. Check out the Improve Your Wild Trout Game article for more tips. Don't kill yourself on fly selection. Like previously mentioned, presentation of your fly is much more important than fly selection. Wit that being said, make sure you have some #14 Yellow Stimulators, #14-16 Yellow and gray Para Adams, #14-16 Elk Hair Caddis, hoppers, beetles, ants, and Extended Body Inchworms. As far as nymphs go, Red Fox Squirrel Nymphs, Pheasant Tail Nymphs, Soft Hackles, Copper Johns, Princes, and a few San Juan Worms will work well. If streams do rise in response to the forecasted storms next week, don't hesitate to throw a Wolly Bugger, Zonker, or Sculpin pattern. Decent Fishing... Unless You're On the Coast. I won't go into too much detail on Hurricane Irene here on the blog. I will say that if you are living on the NC coast, particularly along the OBX, buckle up. A bumpy ride could be on the way. I included the word "could" because the track of Irene has been consistently trending eastward. Still, put that tidbit in the back of your mind and prepare for a landfalling hurricane, but pray the wrath of Irene will stay offshore. Our state has seen its fair share of hurricanes. Still, the less we get, the better (obviously). Much more info on Hurricane Irene over at the all new Carolina Weather Blog. I'm updating over there frequently as Irene moves. All we can do is prepare for the worst and hope for the best. Unless Irene tracks a considerable distance to the west, folks well inland won't know a major hurricane is passing along the coast. 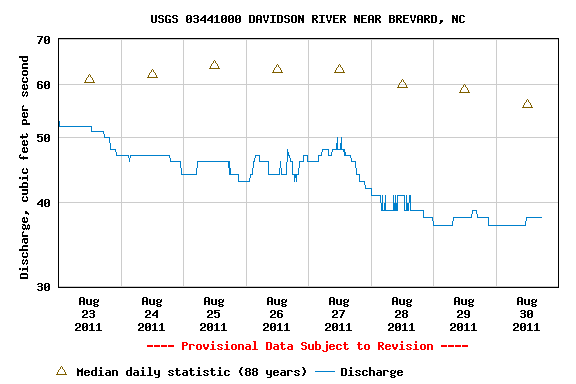 So, fishing here in WNC will likely continue to be great. 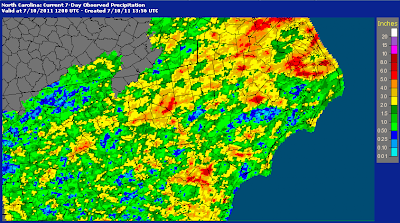 We could use some of the plentiful moisture Irene is producing. Streams are not dangerously low, but they're in need of some replenishing rainfall in order to keep us from reaching those dangerously low flows. Levels are, for the most part, what you'd generally expect in late August. Fine tippets and long leaders are a necessity. Wild trout that are rarely pressured are usually not leader shy and will eat your fly on 4x tippet. On wild waters that are sandwiched between two walls of rhododendron and vegetation, a heavier tippet is useful. If you're back cast snags a tree, heavier tippet will up the chances of getting that fly back. Until October 1st, wild waters, C&R waters, and the smallmouth rivers will be your best bet. TN tailwaters are also very popular destinations this time of the year if you don't mind the drive. So, what's on the menu? Well, not much has changed since June. Your usual summertime patterns will suffice. I would go with nymphs in the morning, then terrestrials in the afternoon, before switching to dries in the evening. The 6-8:30pm time frame every evening should yield plenty of hatching yellow sallies, light cahills, yellow/light green stones, and maybe even a few "surprise" bugs. On most rivers, you should catch fish all evening on a #14 Yellow Stimulator. Don't be surprised if you see a giant American Salmonfly clumsily fluttering around at dusk. Continue sending in those Carolina fish pics for the THFF.com Fish Wall! I've decided to create a separate blog dedicated to weather. Carolina weather in particular. As anglers (or outdoor enthusiasts) the weather is a major factor. While you can fish in the cold, the heat, the rain, and the snow, knowing what to expect so you can plan accordingly is strongly recommended. At Carolina WX (WX is short for weather) I'll blog about hurricanes, snowstorms, ice storms, t'storms, and just about everything in between. Even though it's focused on the Carolinas, you'll see posts revolving around events from other parts of the country (or globe). Check out Carolina Wx, here. Check back often, as I'll be posting pretty regularly as hurricanes threaten the US or winter storms affect the Carolinas. This is pretty cool. A couple of guys filmed several "bugnadoes" along the Missouri River. They're likely mating midges. At times, they're so thick they take on the appearance of a tornado. It truly is a floating trout buffet! Stepping out onto the back porch tonight was refreshing. Here in Carolina, (really the entire southeast), you have to be up before dawn, but after 2am in the morning in order to feel some cooler temperatures. Once the sun peaks over the pines, the Carolina clay, softened from the morning dew, is quickly turning to rock. Nine times out of ten, it's not a dry heat around here. It's humid as all get out. Heat and humid are inseparable sidekicks from May through August around these parts. On rare occasions, one will take a break and we scramble to enjoy every moment of it. This year, those occasions were few and far between. So, when you glance at the forecast and read words such as "cooler" and "less humidity", you don't know if you should jump for joy or wonder if there's fine print you didn't read. No joke folks, cooler temps are coming to the rescue, as a strong cold front—the one that's producing some gnarly t'storms over in Oklahoma—advances west across the plains, eventually passing through the Carolinas late tomorrow night and early Sunday. I'm thinking those 7 consecutive days of 90s are behind us. The cold fronts should break the heat up before it gets too bad. Storms are expected to roll rumble through WNC as the front enters and exits. Some locations may see some a few lone storms during the day tomorrow, but the most widespread coverage of storms should occur tomorrow night into Sunday. Heads up if you're fishing tomorrow, as you may encounter a few storms. If you're planning on fishing Sunday, keep an eye on the forecast and an eye to the sky. These storms will have the potential to produce hail and unleash some strong winds. Heavy rain will cause streams to quickly rise, so be ready to jump out of the water upon first notice of the river rising. Streamers will be effective where heavy rain causes rivers to rise. A #10 Woolly Bugger or Zonker should be perfect. Other times, a Green Weenie, Extended Body Inchworm, Inch Caddis, Yellow Stimulator, Yellow Para Adams, Copper John, Prince, or Pheasant Tail Nymph (just to name a few) should work well. If you don't see any fish, locate a small waterfall, chute, or some turbid, whitewater. Trout are concentrating in these areas, where dissolved oxygen is at its greatest. Play the fish as quick as possible, try not to tire him out completely, and send him back ASAP. Send in those fish pictures from NC if you'd like! I'll post them to the THFF Fish Wall for fellow anglers to enjoy. Details are in the post below. Have a great fish pic snapped here in NC? Would you like to share it? Now is your opportunity! Shoot me an email at wncflyfishing@gmail.com, or send it to me via Facebook, Twitter, Google+, or on the forum under the Photography section. It doesn't matter if it's a vintage photo of your grandfather fishing the Pigeon River in 1928, a picture you snapped of a colorful wild brookie on the bluelines, a smallie caught from the New River, or a Redfish caught on the coast. As long as the fish was caught with a fly rod, send it in! Scenic fly fishing photos of a fishy looking stream are also welcomed. 1) Include your name (please specify if you're okay including your first and last name, just your first name, or if you'd rather go by anonymous). 2) Where you landed the fish. If it's a wild stream, I won't include the name. 3) If you have a fishing related website/blog, include the address and I'll link to your site. So, without further ado, let's see some fish pics! 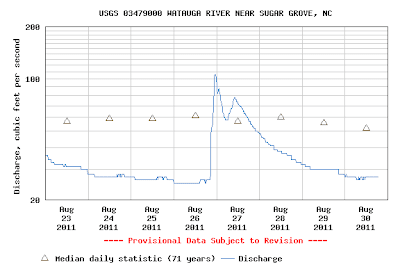 - Buckeye Creek, Watauga County (Buckeye Creek Reservoir dam to Grassy Gap Creek) designated as Hatchery Supported. bridge at end of Andrews Avenue) designated as Delayed Harvest. by a sign on each bank]) Designated as Delayed Harvest. S.R. 1534 bridge at Wilmot) designated as Hatchery Supported. - Ararat River, Surry County (N.C. 103 bridge to U.S. 52 bridge) Designated as Delayed Harvest. -Coffee Lake, Watauga County, designated as Delayed Harvest. - Elk Creek, Wilkes County (portion on Leatherwood Mountains Development) designated as Delayed Harvest. To see the additional minor changes, click here to read them. Changes to the regs are in red. A couple of new DH waters are being considered for 2012-2013. They include (but are not limited to) 0.6 miles of the Catawba (McDowell Co. portion), 1.5 miles of Elk Creek (Wilkes), and reclassifying the lower 2.5 miles of Big Horse Creek (Ashe) as DH. We'll see what happens! To see the full list of proposals, click here. Construction is underway on the all new Fly Fishing Trail website. Not to be confused with Jackson County's WNC Fly Fishing Trail, the "trail" isn't actually a physical hiking trail. Instead, it's a "trail" of some of the best trout/smallmouth waters nestled between Mt. Mitchell, Roan Mountain, and Grandfather Mountain. While fishing this area, you're never too far from some of the highest peaks in eastern North America. The streams all run through Madison, Burke, McDowell, Yancey, Mitchell, and Avery Counties. Once the site is complete, information from the best places to fish to accommodations and area attractions will be easily accessible. 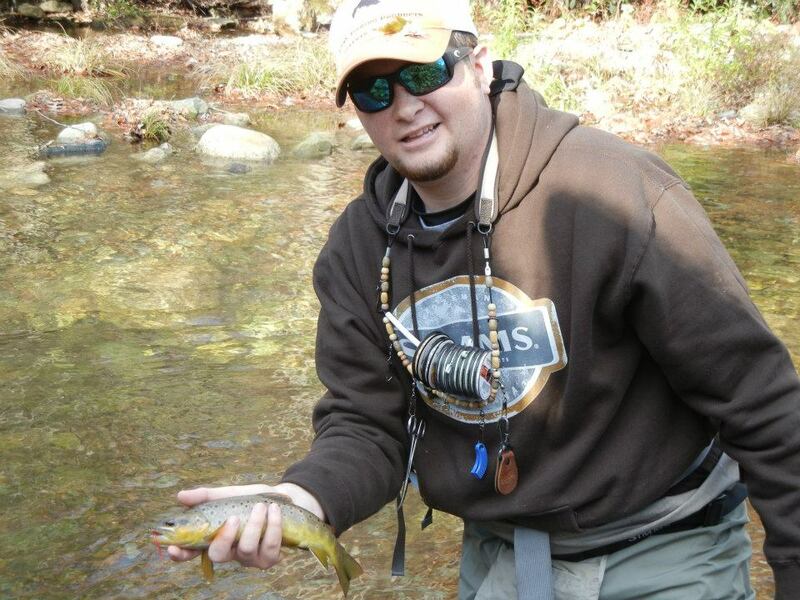 Tucker Horne, a current member of the NC Fly Fishing Team, is putting the website together. So far, it looks incredible. Looking forward to the finished product! Make sure you give their Facebook page a like for updates and news! Welcome to the East Coast's "Largest and Best" Fly Fishing Trail! 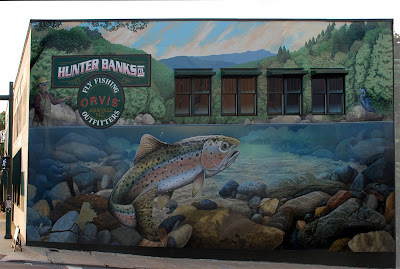 "The Fly Fishing Trail", located in the high country between Boone and Asheville, features some of the best trout waters in Western North Carolina. These waters are situated between Mt. Mitchell, Grandfather Mountain, and Roan Mountain... all of which exceed 6000 feet in elevation. 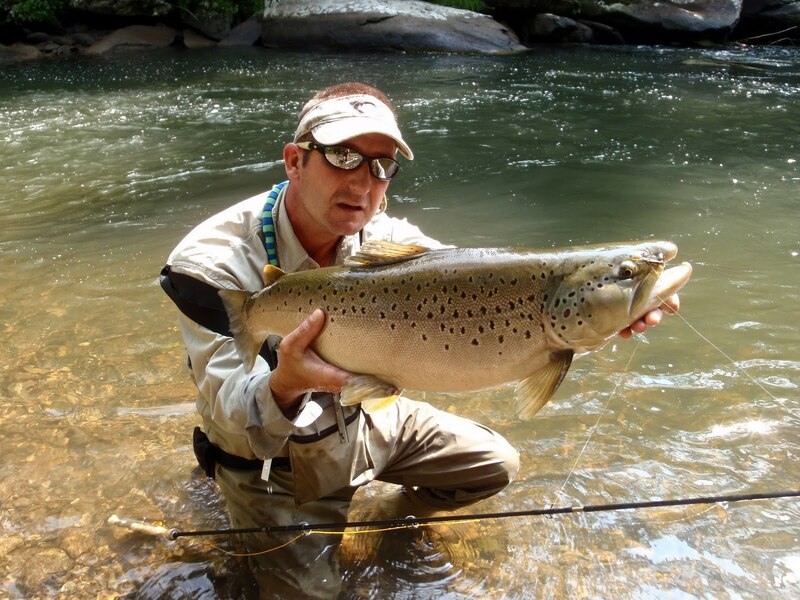 "The Fly Fishing Trail" details over 500 miles of pristine trout and smallmouth waters. Whether chasing brook trout at 4500 feet, brown trout on a tailrace, wild rainbow trout in one of our many wilderness refuges, smallmouth bass on the North Toe River, or chucking 10 inch streamers after musky, the waters in this region offer the fly fisherman a lifetime of fishing opportunities. Whether you seek quantity or size, open water or small streams, "The Fly Fishing Trail" is your guide to the best fly fishing on the East Coast. Planning your fly fishing destination trip is made easy here on "The Fly Fishing Trail" website. Complimentary maps, stream detail, hatch charts, lodging information, area attractions and more are available here. Use the Trail Guide to make arrangements for accommodations at one of the local cabins, campgrounds, or inns, learn about local restaurants, shopping, area attractions, and even book a guided fly fishing trip with one of the local guide services. 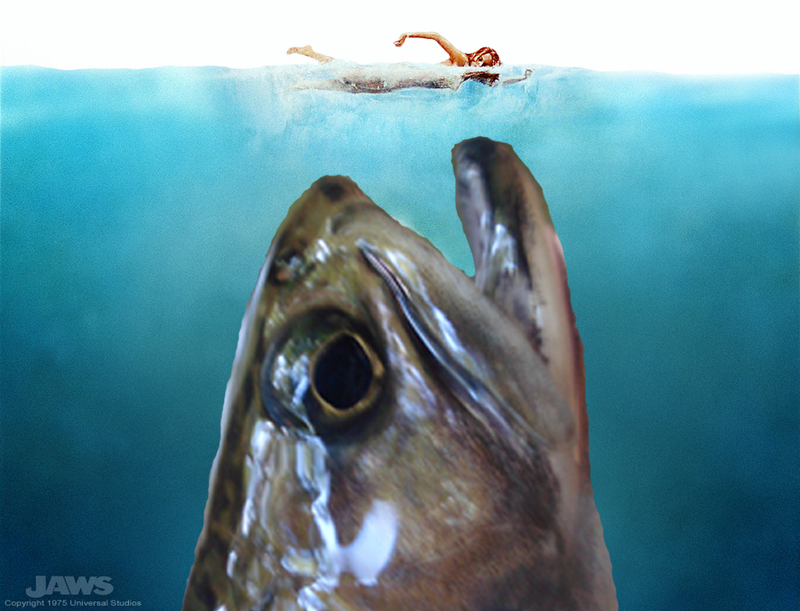 While watching Shark Week, I began to wonder why there isn't a Trout Week. Instead of breaching Great Whites snatching a seal from the surface, how about a big brown leaping out of the water to engulf a mouse? Just a thought. As a fly tyer, both commercially and non-commercially, I've grown a bit worried with this whole hackle extension fashion trend. Metz and Whiting were apparently not prepared for this sudden rise in demand for hackles. The fad started well before Steven Tyler displayed them on American Idol. To my knowledge, Steven did remind people feathers look great when you stick them in your hair. That's enough hackle to tie at least 3 dozen Para Adams. If this fashion trend continues, we could be looking at an increase in the price of flies. We all thought gas prices were (and still are) bad enough. Now we may be facing some pricy flies to top it all off. It's a waiting game. A nervous, hoping-for-the-best kind of waiting game. Microbarbs are apparently the most sought after hackles, so if you tie with them, it may be a good idea to stock up now. What do you guys think about all of this? The Blacks from THFF Media on Vimeo. has been lacking. Acid rain is likely contributing to the stream's lack of fish. The bitterly cold winter is another likely culprit. Kevin and I didn't lay eyes on a single fish. Other than a few mayflies, there was very little in the way of aquatic life. I've noticed this the past few trips, but I gambled and suggested we check it out. Albeit the fishing was nonexistent, the scenery and the stream itself was worth it. It's sad the fishing isn't what it used to be, but that's the harsh reality of life at these elevations. Playing it smart, we hiked back out of the stream as a thunderstorm approached. The entire hike back out of the valley was in the rain. By the time we reached the trailhead, we were drenched. In an attempt to reverse the so far fishless day, we mapped out our next move and jumped to the next few streams. Thunderstorms kept rolling in and rolling out, so we continued to stay drenched. The fishing picked up though, as we began catching many colorful brookies on dries. You simply cannot beat wild fish on dries. Let alone wild fish that are the only native salmonid to NC, NC's state fish, and as colorful as these guys. For me, the tug is not the drug. Why do we go these extra distances to catch these "minnows?" The adventure, the fact that you are likely the first human being to lay eyes on a stream, the scenery God presents you with, and watching as a fish, so hardy and adaptable as the Southern Appalachian Brook Trout, rise to your offering of foam and feathers. THAT is why we do it. It's addictive. It's adventurous. It will get your heart pumping. The great and the ugly. 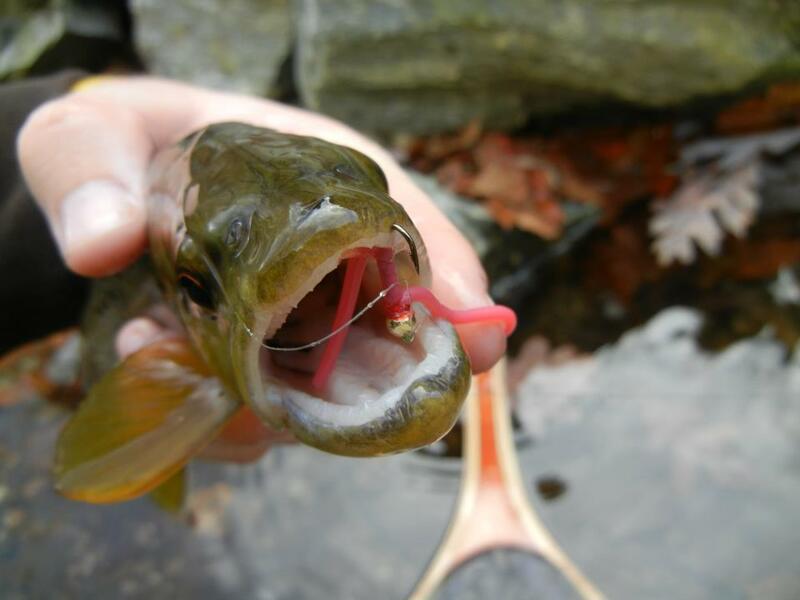 No, not brown trout and lampreys, but some great and not so great news from around the state. I'll start with the great news. Lastly, the ugly news. About 400 miles due east of the mural in Asheville, a 6 year old girl was attacked by a shark in a foot and a half of water on Ocracoke Island. It happened about an hour and a half ago. If you watch Shark Week every year like I do, you probably know Bull Sharks are commonly seen in very shallow water. They're like huge shallow-water-loving redfish. Except they have rows of razor sharp teeth, require a 14-15wt, and are rarely seen rooting for small crabs in spartina grass. A lot of folks think the real dangers are farther out in deeper waters. Unfortunately, in this incident, we were reminded that attacks can happen out in the middle of the ocean, or, in this case, a few steps from the shore. The girl is in critical condition. Keep her in your thoughts and prayers. 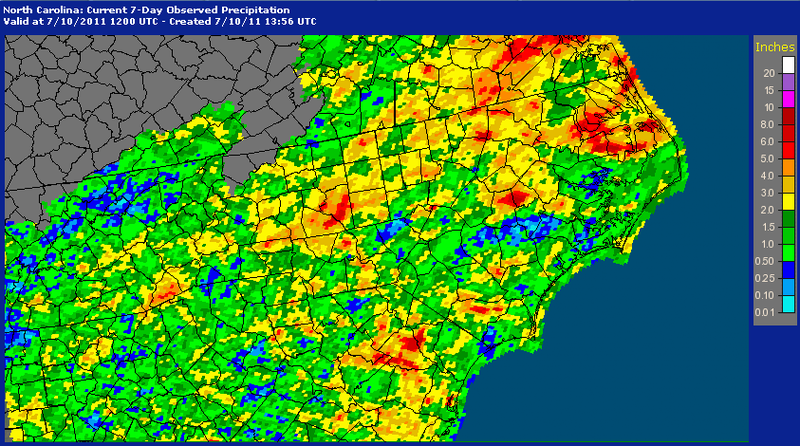 Rain amounts over the past 7 days (Radar estimates). 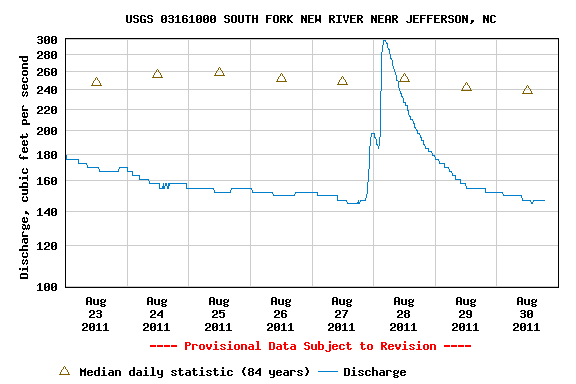 So far, extremely low water hasn't been a prolonged issue this summer. We'll see periods where rain is scarce, but before streams get too low, thunderstorms save the day. Along with decent water levels, drought isn't a concern as of now in WNC. These storms have really helped us out. There's always a catch though, it seems. That "catch" is the heat. The mercury will rise to the highest temperatures we've seen thus far this year. In the Piedmont, heat index values are expected to climb to 105-109 degrees. High humidity as well. It will be cooler in the mountains though, especially the higher you go. The highest peak in eastern North America, Mt. Mitchell, will of course be much cooler than the lowlands. It looks like lower 70s for highs around the summit tomorrow. Relief is on the horizon though, as temps will back off a bit later this week. Fishing is not too bad in WNC. Higher elevation streams are by far fishing the best. They are providing both trout and anglers more comfortable temps. As is the case in the warmer months, fishing is best in the morning and again in the evening when temperatures are cooler. Nymphs in the morning and dries in the afternoon is the way to go. Pheasant Tail Nymphs, Copper Johns, Lightning Bugs, Green Weenies, an Inch Caddis, Prince Nymph, and most generic nymphs should work well. Don't be afraid to throw a terrestrial in the morning, as fish are keying onto them no matter what time of the day. Try a foam hopper, Turk's Tarantula, ant, beetle, or Extended Body Inchworm. Look for caddis, yellow/green stones, and Light Cahills in the evening. What your profile will look like. Facebook is about to be shoved into the dirt. What could possibly put Facebook out of business? Well, Google is at it again. Their most recent project, Google Plus, is only available to those with invites, so it's not open to the public just yet. Rumors have been spreading regarding an end-of-the-month "opening of the admission gates" at Google Plus. Once that happens, you can sign in just like you would with Facebook, without an invite. Like said, it's limited to those who have invites. Yesterday evening Jason Puris over at The Fin hooked me up with an invite and I was able to join Plus. As a longtime Facebook user, I was able to detect the differences between Google Plus and the largest social networking site in the world, Facebook. So far, the angling community is extremely small. I've only found 7 anglers. With some time, 7 will grow to 700 anglers pretty soon. Everything about Google Plus is incredible. The ability to share posts with certain "circles" or groups of people is ingenious. For instance, if you want to share a fishing related post and don't want to share it with everyone, just create a circle entitled "Fisherpeople" or "Fishing Buddies" add all of the anglers who you're following and check it off when you're posting. If you have a family reunion, click "Family" and your post will only be visible to everyone in your "Family Circle." It sounds overwhelming, but once you've delved into it, you'll start to get the hang of it. Kyle Perkins, who is a writer, blogger, and angler, told me we're all going to put together a "Fly Tying Hangout" on Plus in the future. Basically you have a webcam, a microphone, and your vise and have a "fly tying hangout." Sounds pretty cool. All in all, I'm stoked about using it. Hopefully more and more anglers join. With that being said, if you would like to try it out, leave a comment below with your Gmail address. Only Gmail is allowed, as it's all Google oriented. Once the gates are opened back up for more users to join I'll invite those that want in. Google is allowing groups of folks to join before closing the gates again. It's a small window of time (only 4-5 hours last night) for new members to join. The dog days of summer are upon us and people are searching long and hard for any possible way to stay cool. Like humans, trout seek cooler refugees away from the heat when the temperatures soar. Have you ever wondered why the fishing was great in the spring, but is downright horrible in July? In this article, you'll discover tips to not only stay cool out on the river, but catch fish as well. Trout and heat don't mix. 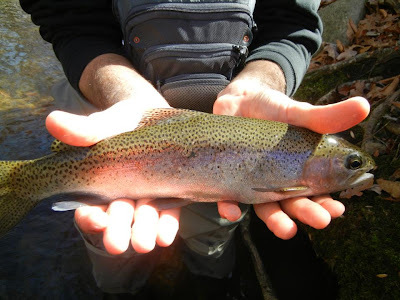 Trout are coldwater fish and are incapable of thriving in warmwater. When the heat rises, the dissolved oxygen in rivers and streams plummets. Without a deeper, cooler refugee that holds more dissolved oxygen, trout become very stressed. Dissolved oxygen is essentially microscopic oxygen gas bubbles in the water. As water moves moves past a their gills, those microscopic bubbles are circulated into the bloodstream. The colder the water, the more O2 gas bubbles for the trout to soak in. Just like all terrestrial animals on earth, without oxygen, life can't go on. Just because the "temperature tolerance range" extends to the low 70s for brown trout, doesn't mean it's healthy for them. They can withstand water temperatures this high, given they can seek shady, slightly cooler areas of the river. A lot of times in the summer, you'll find more fish closer to the banks, where thick overhanging trees and vegetation provides them with shade and cover from predators above. Along with shade, trout will seek more turbulent water, where dissolved oxygen levels are more plentiful. A plunge pool is a perfect example. Zero out these areas and work them over. When the sun begins its descent behind the mountains, fish will usually spread out as evening hatches begin. What Flies Do I Use? Here in the southeast, it's rare to find wild trout that are extremely selective. Nine times out of ten, fish will rise to a fly randomly picked from your box. As long as it looks like food and acts like food, most fish won't be fickle. The better question would be "how would I go about presenting my fly?" It depends on the fly of choice. A small Parachute Adams is designed to land on the water softly. The Adams dry fly imitates dark bodied mayflies and mayflies land on the water's surface softly, so your fly should land on the water softly. On the other hand, a big hopper is a bit heavier, thus landing on the water with a "plop" sound. Your hopper pattern can be "smacked" onto the water. Don't overdo it, but a quick smack on the surface usually sends the trout into attack mode. Aside from mayflies and hoppers, yellow and green stoneflies, ants, beetles, inchworms, cicadas, a list of caddis species, and much more are usually readily available throughout the summer months. This time of the year, the trees have plenty of leaves and new growth to snag your flies. Make sure you have enough to share with the trees and still have some remaining flies to fish! Aside from keeping yourself safe in the heat, this is the second most important thing an angler should know and properly carry out. Playing trout in the heat is extremely important. If the water temps are just too high (upper 60s on into the 70s) it's in your best interest to hit a higher elevation wild stream or make your way to a tailwater. Playing trout in the heat can be both stressful and life threatening to the fish. Remember to play them as quick as possible, keep them in the water, lifting out of the water for a brief moment when the cameraman is ready, and taking your time in reviving the fish to ensure he swims away on his own. If you can, revive the fish in faster water (where the dissolved oxygen is more plentiful) and release him in slower water. Long days out in the heat, humidity, and sun require special clothing. A t-shirt is OK, but an SPF, breathable, and lightweight fishing shirt is much better. Long sleeve is also a good idea, believe it or not, as long as the sleeves have an effective way of releasing heat. I've been wearing Simm's popular long sleeve Solarflex shirt for a good while now. Not only does it keep the sun off of your arms and neck, it allows heat to exit effectively, allowing for protected arms. Lather up the sunscreen as well. As for hats, it's a personal preference. Personally, I've grown to love trucker caps. A lot of anglers have grown to love them. Along with wearing the proper clothing, drink plenty of water and if you're doing some hiking to reach that wild stream, take breaks as needed. Last, but not least, leave the waders behind. If you would prefer not to get wet, wear lightweight, breathable waders. Neoprene waders are way too thick. Wet wading is the way to go. Wading wet will keep you cool and comfortable. Pick up some comfortable wet wading shoes, or grab some wet wading gravel guards and wear your wading boots. Don't let a little heat stop you from sitting inside all day! With some quick planning and a willingness to relocate to a different stream, fishing can be spectacular this time of the year. Southeastern Anglers guide Mark Scarborough hooked and landed this behemoth of a brown trout on an NC public water tailrace earlier this month. Mark caught this beast on a day off from guiding. I won't name the river, just as you wouldn't a secret blueline stream. Although, a lot of you guys probably know the river right off the bat. If you do, please don't name it! Thanks to Mark Scarborough of Southeastern Anglers for allowing me to post the photo. Check out Southeastern Anglers on Facebook and be sure to visit their website. Scott | behind the scenes from Scott Fly Rods on Vimeo. Pretty decent fishing out there! Almost daily t'storms have kept most rivers and streams at normal levels. Rain has also kept the water temps down. We receive a short hiatus tomorrow from the heavy rain and lightning associated with these frequent afternoon/evening storms. The humidity looks to take a break tomorrow, but it will return. Looking at the forecast, t'storm chances will enter the picture once again on Sunday and stick around throughout next week. Temps look to be pretty comfortable, ranging from the mid 60s tomorrow on Mount Mitchell to the mid 80s in the valleys and lower elevations. Trout are looking up for terrestrials. Try a foam beetle, Extended Body Inchworm, an ant dry, or a hopper. Cast under overhanging trees, but don't be afraid to work the middle of the river. Terrestrials generally fall out of the trees and vegetation along the bank, but currents will eventually force most into the middle of the river where a lot of times, a trout's stomach is the bug's last stop. 1. An inchworm dry of some sort. 2. A #10-12 Green Weenie (which imitates a drowned inchworm). 3. A #14-22 black ant. A foam ant works well, as it stays afloat. 4. #14-16 Yellow Parachute Adams. 5. A hopper. Whether it be a foam hopper, Dave's Hopper, or one of your own creations. If you head out the river, have fun! Tell us how you do! Over the past few days I've been exploring some of the best fly fishing SW Virginia has to offer. My homewaters of western NC will always be my favorite, but man alive is there some good fishing up here. Whitetop Laurel Creek, which I fished on Tuesday reminded me of a mix between the South Toe and the Davidson. It's the best freestone trout stream in the state of Virginia. Wild trout, some of which were pushing 20", plenty of diversity, and a nutrient-rich stream all combine to make Whitetop Laurel number one on my list of best trout water in Southwest Virginia. Throughout the week, I've had the camcorder at my side on every fishing trip. Every now and then, I was introduced to some great filming opportunities. The short film below includes those shots. *If the video is slow, or lags, let it buffer or turn HD off. Click the outward pointing arrows to watch in full screen. The Blue Ridge | HD from THFF Media on Vimeo. The winner of the first THFF.com fly giveaway is..... Anonymous, with the comment "Great fishing this weekend. Could use these flies for all the ones I donated to the laurals and trees." Anon, shoot me an email at wncflyfishing@gmail.com with your mailing address and I'll send 2 Extended Body Inchworms, 2 Vinyl Rib Stones, 2 Nymph Skin Stones, and a couple of "surprise" flies that are proven winners here in the Tar Heel State! We'll do another giveaway pretty soon. I think this is an excellent idea. It's a thing of beauty and will hopefully keep the vandalism at bay. Check out the article at Asheville's Citizen-Times. 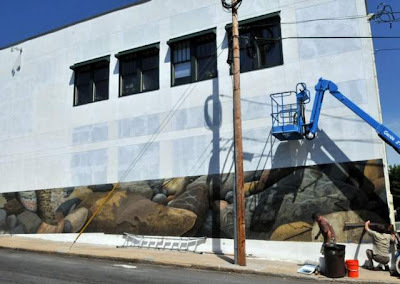 Looking forward to seeing the finished product, which is scheduled to be completed tomorrow. Here's the results from afternoon of fishing, filming, and editing. After 7 years of hunting a particularly large catfish in this pond, today was the day he lost and I won. All on a 6wt and a Bunny Leach. The image of this large cat slowly pursuing my fly and inhaling it is forever burnt into my memory. Warmwater HD from THFF Media on Vimeo. Next stop is quite possibly Whitetop Laurel Creek in SW Virginia early next week.